At Inventors Sprints, science and engineering students spend all day tackling a real-world problem identified by a company or organization from outside UT. Photo credit: Vivian Abagiu. 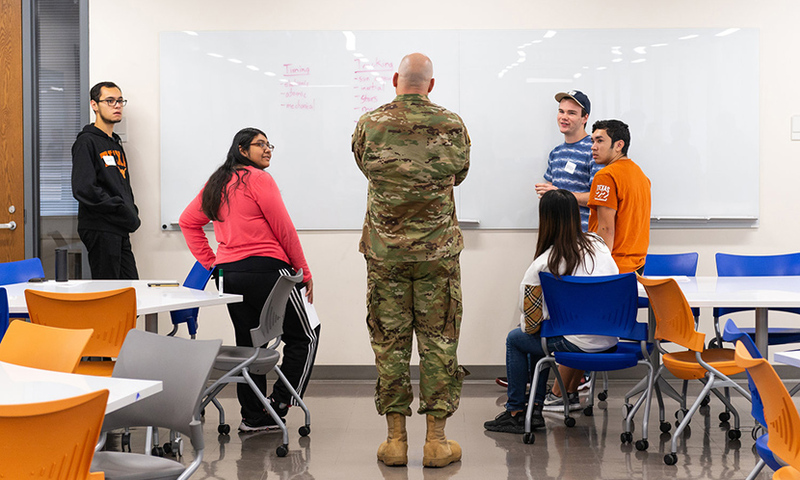 WHAT: Teams of science and engineering students from The University of Texas at Austin’s new Inventors Program will showcase their innovations, including new wearable devices and interactive augmented-reality exhibits, as they work to solve real-world problems presented by Army Futures Command and other Central Texas entities. MEDIA: The event is free and open to the public. No tickets are required. Media should email christine.sinatra@austin.utexas.edu. Launch an augmented-reality exhibit to teach lessons about ecosystems. INTERVIEWS: Faculty members, student inventors, industry experts and members of the Army Futures Command Center, including Maj. Gen. James Young of the 75th Innovation Command, will be available for interviews at 2:30 p.m.
1 to 2:30 p.m.: Pitch Session – Student teams pitch their innovations to a panel of local experts “Shark Tank”-style. 2:30 to 4 p.m.: Roundtable Session – Student teams demonstrate their innovations and answer questions from attendees. 4:30 to 5:15 p.m.: Guest Reception – Members of the media may attend, along with industry guests and alumni. 5:15 to 6 p.m.: Keynote and Awards Ceremony – Inventors projects awards will be given alongside awards from the day’s Undergraduate Research Forum.